Israel on Thursday denied that a cease-fire had been worked out with Hamas, saying that Hamas demands were unrealistic. Israel on Thursday denied that a cease-fire had been worked out with Hamas. The BBC reported that both Israel and Hamas had agreed to a “comprehensive” cease-fire, which would go into effect 6 AM Friday. The reports, said the BBC, was based on Israeli sources. According to the report, Israel had agreed to two of three Hamas key demands; a reopening of the Rafiach crossing (under the control of Egypt; the report said that Cairo had agreed to this as well), and the reopening of crossings into Israel to allow free travel to Palestinian Authority-controlled areas of Judea and Samaria. Israel has not agreed to another Hamas demand, the rerelease of terrorists formerly released in the Gilad Shalit deal who were arrested last month in the IDF sweep of Hamas, as soldiers searched for the murderers of Israeli teens Eyal Yifrah, Naftali Frenkel, and Gilad Sha'ar. An Israeli official said that there was currently no agreement, and that the BBC report was “wildly optimistic. Hamas' demands are way out of proportion” to what Israel is prepared to give. A Hamas spokesperson also denied the reports. The report came out as the UN-inspired “humanitarian” cease-fire was set to expire. The cease-fire was violated by Hamas, which fired three mortar shells at front-line communities in Israel. Israel did not respond to the attack. 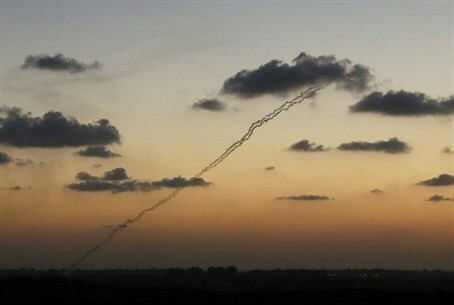 Meanwhile, despite the UN cease-fire, which Israel agreed to, Hamas continued firing rockets Thursday morning. A barrage of rockets was fired at Beersheva. The Iron Dome system knocked out four of the missiles. No injuries have been reported. Hamas also took responsibility for an attempt by terrorists to conduct a major terror attack in Israel by infiltrating through a Gaza terror tunnel. The 13 terrorists involved in the attempted attack were apparently surprised that they were being observed by Israeli soldiers, an IDF official said, and attempted to return to Gaza via the tunnel, at which point an Israel Air Force plane destroyed the entrance to the tunnel.